"I recently snuck into Bianchi USA’s headquarters and talked to company president Rod Jewett about their new 2009 line-up and trends in the industry. 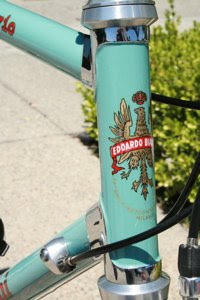 One standout in the new line-up is a limited edition, lugged steel bike to be known as the Dolomiti. The pre-production example that I saw had chromed lugs and 1950s/60s style logos. 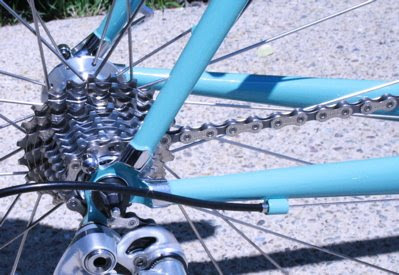 Strangely, the bike had a carbon fork, but Jewett hinted that they might be able to offer US buyers a chromed steel fork. 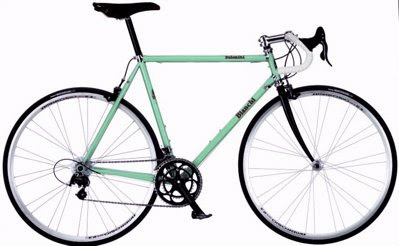 Of course, the bike is painted in Bianchi’s glorious sea-foam green hue, better known as celeste. If any big bike company could mount a full-on retro attack, it would be the company with 124 years of tradition. The 2009 Dolomiti will have Campagnolo Veloce 10sp, featuring the newly reshaped Ergopower hoods. I get the feeling that a lot of people are on the fence about the levers’ new aesthetics, but I can say that I really like the feel of the levers." My friend Eddie alerted me to a granfondo-type of event that is scheduled in Pennsylvania on September 6, 2008 in Souderton, preceding the 11th annual Univest Grand Prix. The Univest Grand Prix is one of only thirteen Union Cyclist International (UCI)-ranked professional road cycling competitions for men in the United States. More than 150 professional riders from 20 countries will compete. "Cyclosportif" is a European term for recreational cyclists who enjoy the challenge of riding a professional level course. Popular Cyclosportif events include "L'Etape du Tour" (http://www.letapedutour.com/), an event where the "cyclos" ride a complete Tour de France stage. The 2008 Univest GP Cyclosportif participants will experience the same excitement and pro atmosphere as their European counterparts while tackling the famed race course of the Univest Grand Prix. Two distances are available 100k (60 miles) and 60k (40 miles). Riders will receive official finishing times (Electronic Chip Timing by Premier Sports), on-course technical support, a post-ride meal and great raffle prizes totaling over $10,000. Commemorative jerseys will be available for purchase. After the ride, the "Cyclos" may shower and then enjoy VIP hospitality with a post race meal while watching the finishing circuits of the pro race live and on the large giant screen TV coverage from 11:00 - 2:30. It's a full day of exciting cycling at its finest. Hospitality tent near the straight after the first turn with live TV viewing. Post race meal and prize drawing. Parking, shuttle and showers at the Souderton High School. A special Cyclosportif jersey will be available for sale for $60 at the event. Advance registration is highly recommended! The combined field limit is 1500 riders. Only pre-registered riders are guaranteed to receive an event t-shirt, official finishing time, and lunch. Register online at BikeReg.com. Online registration closes on Wednesday September 3, 2008. Day-of registration will be subject to a $10 late fee. Day-of registrants are not guaranteed to receive the official t-shirt, the lunch, or a finishing time. There is no guarantee that we will be able to accommodate all day of registrants. Pre-registration is strongly encouraged. Pre-event number pickup will be held on Thursday, September 4 from 5:00pm-7:00pm, and on Friday, September 5 from 12noon-7pm in at the Grundy Auditorium at the Penn Foundation at 807 Lawn Avenue, Sellersvile (get directions) We highly recommend picking up your number before the event! Official Cyclosportif Event Parking is available at the Souderton Sr. High School. All participants should ride their bikes to the Start/Finish area or find additional parking near the race course. Please see directions below. Day of Event number pick-up and registration will be held between 6:00-7:00am near the Pro men's Start/Finish line off of Main Street. Riders must obey all the traffic laws and are required to wear helmets! It will be interesting to see if the event has the electricity of a European event. Our destination, East Middlebury, would take us past Shoreham so we made arrangements to visit George Gross, past member of New Jersey's Bedminster Flyers Cycling Club (http://www.bedminsterflyers.com/). George is spending most of his time in Shoreham overseeing the completion of his family's new home while Barbara is working on the sale of their home in New Jersey. We had understood that George was building some type of solar home but weren't prepared for what we found. It is incredible. He has named his project "Solar Haven". To reach Solar Haven you drive approximately 1.5 miles on a dirt road (80% of the roads in Addison County are dirt)before reaching George's driveway. His driveway is a mini-Galibier, with the grade hitting 15%. You finally arrive at a ridge where Gross home sits perfectly situated for maximum sun and beautiful views. "The Solar Haven project is a state of the art energy efficient house being built in Shoreham Vermont.The Solar Haven design approaches the ideal of a Net-Zero Energy Home (NZEH), a house that on an annualized basis produces as much energy as it uses. Extensive computer modeling guided the Solar Haven building energy design and the lifecycle economics of its building envelope, windows, and energy systems. The Solar Haven project is also enrolled in the Leadership in Environmental and Energy Design (LEED) for Homes program. LEED is an emerging national standard for building environmentally friendly homes. The U.S. Green Building Council develops and administers the LEED program. The Green Build Science company (contact: gmgross@greenbuildscience.com both designed and built Solar Haven. Solar Haven is a three bedroom contemporary with an open floor plan. The house's total footprint as measured by the ANSI Z768 standard is 2,938 square feet, of which approximately 2,500 is finished area. The owners occupy the house's Upper Level comprising: Atrium, Master Bedroom suite, Kitchen, Living Room, and Mudroom. The house's Lower Level will be a Bed and Breakfast guest area containing two bedrooms, an office, and a Family Room. The two utility rooms, storage, and a root cellar occupy the remaining square footage. Beginning in 2Q'2009, Green Build Science will offer B&B lodging to its clients. Guests will be able to experience first hand the benefits of living in an energy efficient, green built home. During their stay, clients will work with Green Build Science to develop their own personalized "green build" plans for either the renovation or new construction of their own residence. Vermont's cold climate is a frigid 7,600 heating degree-days per year! Solar Haven's space heating goal is to consume less than 18 Million BTUs per year. This heating load is only 1/4 to 1/5 the amount of heating energy needed by a conventionally built Vermont home that has the same square footage. Solar Haven goes far beyond the anemic EnergyStar standards developed by EPA under the influence of the building industry. The Solar Haven design leverages numerous features that when combined, reinforce each other to realize its space heating goal: Super-insulation: By super-insulating, the maximum heating load is reduced to a level easily met by smaller capacity and less expensive renewable energy heating strategies, such as passive solar. The cellulose insulation is filled 9" deep in the exterior wall assemblies, yielding R-35 insulation value. In the attic, 16" of blown cellulose provides R-60 insulation value. Exceptionally air tight construction: The objective is to have less than 5% of the interior air volume leak per hour to the outside. In typical homes, it is common to see 30% or more of the interior air volume escape to outside every hour. Passive solar: The house's longest wall surface faces due South. Over 70% of the window area is on the South side. The computer modeling phase searched for the right balance between the window's solar aperture area, window glazing technology, roof overhang, and house's thermal mass. All of these components were optimized to achieve the maximum passive solar heat gain without incurring overheating spikes. High performance windows: The windows are all triple glazed, filled with argon gas, fiberglass frames, and have insulative performance in the range of R-4 to R-6. The South facing windows are custom built with a low-emissivity thin film coating that maximizes the passive solar heat gain while reflecting the interior's heat back to inside. Earth bermed: The house's Lower Level floor is a walk out basement, bermed into a South facing hillside. Earth berming saves energy because the heating plant only has to raise the room's temperature relative to the Earth's constant 45 degree temperature rather than the exterior's temperature and wind. Masonry heater: Solar Haven's primary backup heating system for the nighttime and cloudy days is a wood-burning masonry heater. Unlike a conventional wood-burning stove, a masonry heater is built from several tons of firebrick. A fast burning fire is lite within the firebox and the exhaust gases heat up the brickwork. Long after the fire burns out, the masonry heater slowly radiates its heat over a period of 8 to 16 hours. The masonry heater is expected to provide 70% to 90% of the household's heat during Vermont's most cloudy Winter season, November through January. The firewood is sustainably harvested from the Solar Haven lot's wooded acreage. The total firewood used per heating season is expected to be a little over one cord. Radiant heated slab floor: The secondary backup heating system is a conventional propane-fueled boiler, delivering heat to the Lower Level's radiant heated slab floor. After space heating, Domestic Hot Water (DHW) is a household's largest energy consumer. In a typical household, it represents about 30% to 40% of the energy usage. At Solar Haven, the DHW usage has been minimized by installing best in class appliances and fixtures that achieve their tasks yet use the minimum amount of hot water: a front-loading clothes washer, a dishwasher that uses 6 gallons of DHW per use, and low-flow shower heads and faucet fixtures. The solar hot water system pre-heats the hot water before the on-demand propane-fueled combi-boiler raises the temperature, if needed, to its set point of 125 degrees. There are two 4'x10' solar hot water collector panels mounted on the South-facing roof. The solar hot water system has been sized to provide approximately 2/3rds of Solar Haven's annual DHW energy. Finally, at Solar Haven the electrical energy usage has been dramatically reduced from the typical household's 25 Kilo-Watt-hours (KW-h) per day to less than 12 KW-h per day. Similar as was done for space heating, a variety of energy conservation techniques are applied to reduce the electrical energy consumption to a level that allows the renewable energy system to cost effectively provide the majority of the household's energy needs. With solar photovoltaic systems costing $8 to $10 per "peak watt", an aggressive conservation strategy will save tens of thousands of dollars. The Solar Haven solar photovoltaic system will produce approximately 3,000 KW-h per year, covering about 2/3 of the annual electrical energy budget. In contrast, without applying energy conservation, the 3,000 KW-h solar photovoltaic system output would provide only about 1/3 of the electrical energy budget. Solar Haven's solar photovoltaic system is connected to the national electrical power grid. Consequently, when the system produces more electrical power than the household needs, the power is "net metered" into the grid and credited to the monthly bill. For those times when the system's solar panels are not producing power, the power is drawn from the electrical grid. In the event of a grid black out, the solar photovoltaic system has a three day supply of "critical load" electrical power stored in an array of 16 huge lead-acid batteries. The battery back up allows the household to continue minimal operation of essential components, such as the water well pump, the boiler controls, refrigerator, the kitchen appliances, and the lighting for the high usage areas. In principle, the solar photovoltaic system could be expanded to achieve an annual net-zero balance. Although in the future price/performance breakthroughs are inevitable, as of today producing 100% of one's electrical needs is not cost effective with the available technologies. Instead, the system was sized to meet the household's critical loads when the grid is offline. Today, over 110 million houses in America are built on the dysfunctional assumption that energy is cheap and reliable. Until gasoline reached $4 per gallon, few understood that the laws of economics are not kind: when supply can not meet demand the price increases exponentially. The age of the cheap energy is gone. Although Solar Haven is at the cutting edge in building science, there is no technical barrier to having every new home built to the same high performance level as it has achieved. These extra upfront investments pay for themselves in 3 to 10 years, depending on what assumptions you make about the future energy costs. Even in existing homes, it is feasible to apply these techniques within the constraints of the original house design. Beyond the economics, there is the fundamental satisfaction of becoming energy independent, of having your home secure against the world's forthcoming chaotic events, which in my view are likely to disrupt the nation's energy supply for weeks, months, or even years. You still have time to act, however, all of the signposts that I see suggest that the window is closing. " George offers a variety of energy related consulting services through his firm, Green Build Science and can be contacted at gmgross@greenbuildscience.com. Lastly, thanks to George for a great dinner! Italy in Vermont! And, the end of this trip story. A first time visit to Vermont wouldn't be complete without a look at Lake Champlain and Burlington. The biggest surprise of my visit to Vermont were the incredibly beautiful flowers that were everywhere. Vermont has a very long winter season so I was expecting the dazzling display of nature. This "Tour Vermont" weekend was organized by the Skylands Cycling Club (http://www.skylandscycling.com/) and the club did a fantastic job in organizing everything. The next day started with some good old fashion American blueberry pancakes. The route, a loop, would take us south along Lake Dunmore, as far south as Brandon before winding north again. Photos: those were good pancakes; John, George, Blake; Buz; Kevin (pulling his two children n a Burley) and Blake; the Green Mountains in the distance. After the ride we visited Middlebury, chartered in 1761 and settled after the Revolutionary War. The Otter Creek, the longest river in Vermont, streams through Middlebury stretching its way to Lake Champlain. The former mills in town have been replaced with shops, restaurants, and residences. It's a "must see" town if you are visiting Vermont. We stopped in the charming town of Bristol at a bakery for some terrific muffins. In Irasville we turned westward on Rt 17 and up towards the Mad River Glen ski area. This route is used on the last stage of the Green Mountain Stage Race. The last KMs are challenging and while John was riding strong I was trying to avoid a cramp that I could feel coming on. The side of the road was marked with the KM markers for the KOM prize and to the finish line. Photos: John riding up to the finish, the Green Mountain Stage Race finish line, view from the top (the road is in the center), the start of the descent towards Bristol. From Hancock we headed north on Rt 100 through Granville, stopping at Moss Glen Falls and Warren before arriving in Irasville where we would begin our second climb, the "Appalachian Gap". "Not a Moment Too Soon, I Thought of Tim Russert"